I was goofing off networking on Twitter the other day, and came across this fun 7-question poll by USAA which purportedly gives you “The number you need to retire.“ So obvs. I had to click it. Now, I don’t know if I’m a dummy and filled it out wrong, or if I’m actually the smartest – and soon to be RICHEST! – man in the world, but the results it passed back just about knocked me out of my socks. I didn’t take the time to read in detail how these numbers were actually calculated (‘cuz remember, I was goofing off working hard), but as you can tell I’m a bit dubious. For one, it leaves out one of the most important factors: expenses. And for two, it never asks me about my hundreds of thousands of dollars of debt that I have. Or all that consumer debt I could ALSO have for all they know (fyi I only have mortgage debt. “Only” – hah). It’s funny. We spend so much time thinking, and strategizing, about speeding up retirement, but I’ve never really thought about what the money looks like once IN retirement. I mean, I know I’ll have investments and money in 401(k) and IRA’s etc etc to pull from – which pretty much answers that question up above (I’m not even COUNTING on Social Security!) but my mind immediately wanted to include “passive” before that income word up there. Like, stuff outside of investments. I really don’t know the answer as I’ve kinda stumped myself here, but I reckon I’d have to own some solid businesses or more real estate properties in order to have such a recurring benefit pouring in over the long haul. Either that, or concentrate more on dividend funds while investing, but then I’m back to what I’m pretty much doing now anyways, in which case I just answered my own question? I might just be confusing myself here now, haha, but I’m gonna think on it some more and see what percolates over the next few days. Regardless, I thought it was an interesting exercise to share with y’all today. And a nice takeaway from a poll that really only gave me a few chuckles ;) I swear I just entered normal answers to all their questions! Take the poll yourself and let us know what it says for you. Think about what retirement REALLY looks like, financially-wise. Are you just pulling from investments and Social Security too (don’t laugh)? Or do you plan/want/dream of extra income streams coming in as well? And if so, are you working towards that right now? If not, you should be… Says the guy who’s not exactly doing it himself. I almost forgot! Here were the winners of our “When She Makes More!” book giveaway last week, courtesy of the beautiful (and smart as hell) Farnoosh Torabi. Congrats winners! Her book drops May 1st, but you can pre-order it here if you aren’t one of the two names listed above ;) Hope you guys learned a lot! The site said it assumes expenses are 80% of income, and that it assumes amount saved is net worth. If you had CC debt, I would subtract it from the amount saved answer. The mortgage debt is pretty much cancel out by the house asset, so that’s not an issue (for you at least). I’m not surprised by you initial results. 67 is a late retirement for a good saver, and you’ve been a good saver and a really good starting point, You very likely would have a few spare millions if you worked until 67. The 47 one, however, is definitely off. There’s no way you should need the same amount whether you retire at 47 or 67. There’s way more longevity risk and you’ve got a bunch of early years with no SS so you’re responsible for 100% of the spending. There’s no way I would retire with “only” 2 million at 47 with your income level. Not a chance. I disagree. If you take the Trinity Study into account, and use the 4% rule, statistics say that he’ll just need enough to live off 4% of the principal, and mostly likely it will grow from age 47 on. Especially if invested in index funds, you just need to take his annual spending from age 47 on, multiply by 25, and that’s the number needed. For example, if it’s $4,000/month x 12 x 25 = $1,200,000 needed to retire FOREVER. Take the mortgage out of the equation, and even less is needed. Great breakdown Jacob…I suddenly feel less stress! Definitely digging into your site this weekend. Thanks for all the great info guys – love reading this stuff! I can’t imagine that I’ll ever want to do “nothing”. I just don’t want to HAVE to work in retirement. And if I had a few million dollars surplus, I guess I wouldn’t have to ;) But I’m not there yet. While I don’t have any debts, I also don’t have any decent income… yet. I look at all of the planners too, there are many, Fidelity has the FIP, Quicken has one, AARP, MoneyWatch, FireCalc, etc. All say I am good to go. 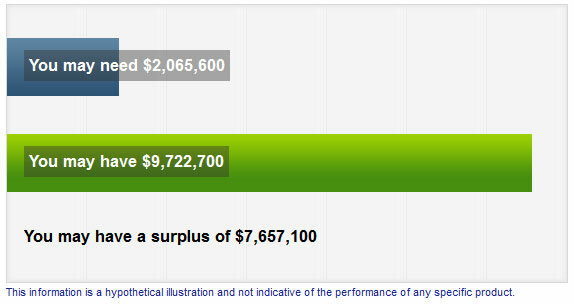 USAA says “You may have a surplus of “$2,005,300”. If I retire in 2 years. There are a lot of details missing, and I always underestimate my after FIRE income and over estimate my expenses, just to make sure. But it is nice to see positive results. Drinks on you “Fo Life”! I am going to take the poll this weekend….keeping my fingers crossed! Honestly, I have not really thought into what I want retirement to look like other than wanting lots of time and flexibility with family. Punching the time clock 8-5 does not allow for that so I better get a plan in action. Took the poll…somebody (I ain’t sayin’ no names) is in trouble. Time to up my game and hang a few more “For Hire” side hustle signs. Lol…. Why do you have to pull from your investments? What if your investments are all just income producing and you never have to draw them down (well other than RMDs from IRAs)? My dad has been retired for 7 years and will take his first RMDs this year. Other than that he hasn’t touched his investments. I know it helps he has a pension, but he also pulls in more than my wife and I make combined from dividends. Why do I know this? He likes to keep me in the loop of his finances in case something were to happen and I had to invoke my power of attorney on them. I am just in the beginning stages of doing “more” than just index fund investing. I hope to build my real estate holdings over the next couple of years to really set me up for retirement! Obviously J. I will have a lemonade stand in retirement. Do you know with inflation a cup will retail for 10 bucks, and still cost me about 2-3 dollars to make. To bring costs down I am going to move to Florida and plant my own lemonade tree. Self-sufficient is always the way to go. To supplement my lemonade business, I will focus on dividend stocks, and real estate. HA and Shh don’t mention my business model to anyone. I”m on the short end of my retirement fund as I expected based on the USAA poll. That will change in the next year once debt is finished we will be bumping p retirement savings. Definitely want to build up some passive income streams to help supplement the retirement income along the way. With spouse, who receives two pensions, social security and dividends, I needed zero! Alone, if I retire at 62, I had a $768,000 shortfall. So much for my divorce plans…seriously though, the huge benefit of a lifetime of income for both of us (spouse took the reduced payout for himself so I continue to receive income should he die before me), basically means if we live anywhere where we can make it on two pensions and social security (even if we didn’t have another dime), we could survive. Now we just need to find that place! Given that USAA focuses on military members/retirees, it’s not surprising that they ask about pensions – you can get a pretty decent pension from the military after 10 years. It’s probably the only employer in our generation that still has pensions. 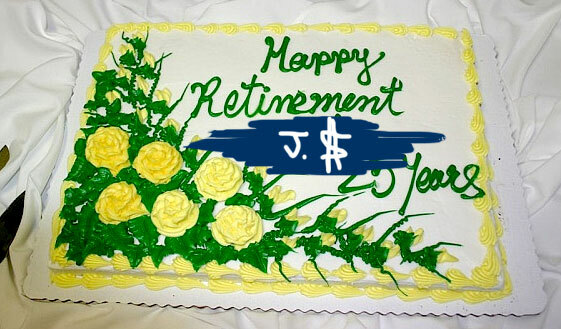 AH there he is, J$, talkin’ retirement! Love it! Keep up the GREAT work, and keep talking about this topic! One can never hear it enough! I say, do the Very Best you can (save as much as can for retirement) with what you’ve got (your personal situation), and that is the Very Best you can do. I don’t pay attention to the articles that say you need a minimum of $1 million to even THINK about retiring, because everyone’s situation is different and some can get by with (much) less while some will require more. I think Fidelity 8x income is a pretty decent goal/rule/piece of info, so I am shooting for that and that is Very Best I can do, period. Heck, I am not even raising kids (I am age 44), and I still find it tough to save for retirement, emerg fund, health insurance co-pays all at the same time and still have some $ for fun on the side (weekend trips and stuff). This is all such hard work, but like you have said in previous posts it takes PATIENCE and PERSISTENCE, but you WILL start to see results! Love your web site and Facebook, J$ !!!!!!!!!!!!!! Haha… I never turn down the option of feeling rich :) Some people say the more you think and believe it the more it’ll come true, eh? That 7-question exercise was a hoot! It is also leading to a morning of suspender snapping ;). You’re ahead in the horse race, but I’ll admit I’m feeling pretty smug over here LOL. Based on retirement at 65, it estimated a $420,000 shortfall. However, the amount that it estimated we’d need for retirement was more than double what I’ve estimated, and the amount it estimated we’d have at that time was over $1 million, which is also more than I think we’d need. It actually came out better than I expected — we’ve not been able to save as much as I’d like, but we’re doing pretty well under the circumstances. We’ve just finished a big expense (baby formula) and my husband has a possible promotion on the horizon, so soon we should be able to save more. I’m pretty happy with things. Well that’s good! I hope it gets better for you guys in the near future too :) Baby formula is no joke, you’re right. We’ve got #2 coming out in about 2 weeks and just praying we don’t have to go that route! Interesting since most retirement calculators try to scare you into investing more with said company by telling you there’s not enough to retire comfortably. 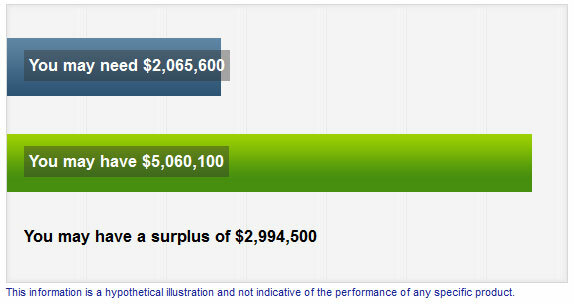 It said I have a big surplus but then I included the equity in my house, which is substantial, and the rental. We also put away a ton into investments each year. The odd thing is it did not ask about monthly expenses and I have no idea how they could possibly compute how much you will need without knowing that. Exactly. Though other smarter people who researched this on my behalf said the formula they’re using to calculate stuff is with 80% expenses. Which is something. That was a fun little survey. It had us at a surplus of just over $3 million at 62. I definitely plan on us doing something in retirement. I’ve seen family members take the traditional retirement approach and just end up doing nothing. That’s just not for me. I think a big part of it will depend on our business, but we’ll definitely be doing something. I did my weekend homework early! Hope you don’t mind. Looks like tons of other people did it too though. So apparently I’m going to have a big surplus too! Assuming that I’m going to be able to hit the max retirement investment every single year of course. Not sure how it calculates estimated living expenses either. I just started investing my money a few months ago so that I can build up a viable passive side income now. Money I hope that we’ll be able to dip in before retirement and during so that I don’t have to rely on retirement only. Plus of course I have to wait a long time to be able to get that money! I also plan to sell lemonade as a cute little ol’ lady when I reach 60…hehe j/k. Laddered Roth Conversions will help you ‘touch’ that $ a little earlier than planned. The Mad Fientist/jcollins discusses this topic a lot. Yup! Was just reading that over again the other day – those guys are crazy smart when it comes to this stuff, you’re right. Fun, but the biggest thing for me is that it assumes I need 80% of my current income in retirement. So, it thinks I need about $2M. I make a great salary, but don’t spend a lot of it now and certainly won’t in retirement. I’ll be frugal and retire earlier, but thanks USAA! Ha! I always think those retirement analyses are full of malarky when you are analyzing someone who is 40+ years away from retirement. I help people plan for retirement, by making smart choices throughout their life pre-retirement. Then it really doesn’t matter what you have in the bank, because you know how to live responsibly. I also don’t think it is wise for anyone under 40 to plan on social security to contribute to your retirement income. I tell them if it is there when you retire, then it will be your “fun” money and not your life money. Looks like I gotta get to work. “If the internet still exists then, hopefully people will still be searching for the bad jokes on my blogs and clicking ads” hAHAHAHA….. Good one. It uses an estimate that you’ll need to replace 80% of your pre-retirement income. That assumes basically that you spend everything make currently. For those like me that live way below their income, this estimate of what you will need is too high. it also doesnt ask about assets held outside retirement accounts. The survey is interesting, but even aside from that your post brings up a lot of good points! I work on hiring for my company and we’ve had a lot of retirees looking for part-time or seasonal work. Some of them seem like they do it because they rely on the income, but many others seem to do it because it’s something they can enjoy and don’t have the pressure of making a certain wage to make ends meet. One is a receptionist and loves the position because she helps her community and gets to interact with people. Others are maintenance workers in the parks and really enjoy being outdoors and gardening. I imagine doing something similar when I retire…doing work I enjoy without stressing about income. I can’t imagine not working at all in some way. I calculated different scenarios and it says I should be able to retire at 62. I was hoping for 60. I agree that 80% of current income is too high so I tweaked the figures and entered an income that if I took 80% of it, is what I thought I would need annually. One thing about the calculator is you can’t back arrow back to try different scenarios. You have to start again by launching a new window. Likely a stupid question, as I have read your information on you managing your own money vs. USAA vs. Vanguard. However, do you choose to have a lot of your investments with USAA for simplicity? I’m dispersed over quite a few different banks, and am curious if others are paying a higher expense ratio with possible less earning for just the simplicity of having it all in one institution. At least you’re aware of the situation and working on improving it! That’s more than I can say for many people out there keeping their head in the sand. So keep going! I just started on my savings for my retirement. I’ve been thinking to buy a rental property so that in the future, it would be my one source of passive income after retirement. Yeah, no way you can ever predict the future fully anyways – just gotta do our best to pay attention and make as many smart moves as we’re able to. Passive income is something I’ve thought a LOT about over the last couple months. To be completely honest with you, I am getting bitter and distrustful in my ripe old age of 28 (haha!). I work for an electric/gas utility, which is typically considered one of the “safer” sectors to be working in, but I could map out 10 different ways I could lose my job in the next year, not the least of which being a merger. I could also map out 20 different reasons why it’s unlikely that I’ll be able to stay in the same job for the next 30 years. That came off more depressing than is should’ve. What I’m trying to say is that I think – for retirement or otherwise – building a passive extra source of income puts you at an extreme advantage. My generation typically doesn’t have pensions anymore, but what if I took my fate into my own hands and spent some of my free time throughout my working years and built up a passive income of a few thousand dollars per month or so? Previous post: Be Proud of Your Emergency Fund!